Having a temperate climate, Atlanta offers its residents four distinct seasons. The flowering of the dogwood trees in the spring brings a festive air to the city, one of the greenest metro areas in the eastern part of the nation. Temperatures average in the 60s during the spring season, leading residents to return in force to outdoor activities, with joggers and bicyclists being the most noticeable as the area’s flora begins to bloom in earnest. 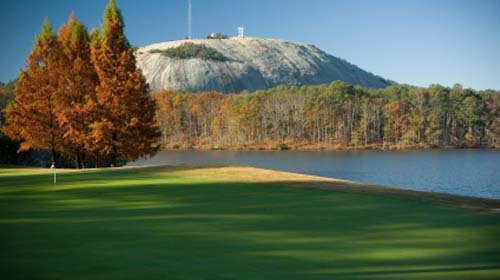 Summers, which can have extended hot and humid spells, are tempered somewhat by Atlanta’s elevation on the edge of north Georgia’s Piedmont region. The summer temperatures average in the 70s and 80s, with many days that seem custom-made for tall glasses of iced tea that stretch time into a slow, long, elastic state. Cookouts abound in backyards and parks as people connect with their “inner griller” and cooking barbeque approaches the status of a sacred ritual. When fall moseys into the Atlanta region, the abundant greenery creates a decidedly more colorful canopy. The temperature starts to cool down and averages in the 50s and 60s. The cooler temperatures provide a welcome contrast to summer’s heat and energy fills the air as the school year hits its stride. Fall is perhaps the most popular season with outdoor enthusiasts as the moderate temperatures keep active sports participants cool and comfortable. Winters can be cold but daytime temperatures are usually comfortable enough to enjoy being outdoors. The temperature averages in the 40s and 50s during the winter months. It’s not unusual to see couples getting engaged in tennis doubles or foursomes out on the links during the winter season. The great numbers of pine trees in the region give a decidedly softer edge to the colder months by displaying their boughs of green needles. Snow and occasionally an ice storm will appear usually only once during the season. Rarely does the weather prevent normal daily activity. The average annual temperature in Atlanta is 61 degrees, making it a typically comfortable climate. It rains an annual average of 116 days out of the year, accumulating to about 50 inches of rain each year. Severe weather by and large seems to bypass the heart of Atlanta, with areas on the northern and southern edges of the metro region experiencing more of the occasional intense weather. The Atlanta metropolitan area has consistently ranked high in overall quality of life when compared to other cities in the county. Location has always been key in Atlanta’s history and today it is no different. Served by one of the world’s busiest airport, Hartsfield-Jackson International, one can reach eighty percent of the U.S. population within two hours. The cost of living in Atlanta is favorable when compared to other major cities in the country. The value of buying a home in Atlanta is high, this is especially apparent compared with other major cities such as New York City, Miami, and Chicago. The average annual salary earned is higher than the national average—another important factor to include when comparing the cost of living. Educators and administrators continually strive to provide the best education possible for the students. In May of 2010, former Governor Sonny Perdue signed Senate Bill 84 into law, which gives Georgia the most comprehensive reform legislation in the country. Atlanta has numerous elementary, middle, and high schools, as well as charter, alternative, and community schools. Atlanta also has a multitude of renowned private schools including The Westminster Schools, which have the largest endowment out of all the non-boarding schools in the United States. Atlanta has many world renowned universities including the Georgia Institute of Technology, Emory University, and Georgia State University. Atlanta has many landmarks that fulfill cultural and inquisitive interests. Attractions for lovers of the arts include The High Museum of Art, The Atlanta Ballet, The Atlanta Symphony Orchestra, and the Alliance Theater. Atlanta also has the Georgia Shakespeare Festival that draws in literature buffs The Fox Theatre and the Civic Center provide = entertainment for all types of audiences. There are also many live music venues, art galleries, and comedy clubs. Entertainment and historical attractions such as the Fernbank Natural History Museum, the Carter Presidential Center, the Atlanta Botanical Gardens, the Coca-Cola Factory, the Atlanta Aquarium, and Zoo Atlanta offer entertainment and education for individuals, couples, and families of all types. For the adventurous type day trips and outdoor activities are plentiful. Whitewater rafting on the Ocoee River is only two hours away, hiking at Stone Mountain or Kennesaw Mountain is merely thirty minutes away, and swimming in the Atlantic Ocean is just four hours away. 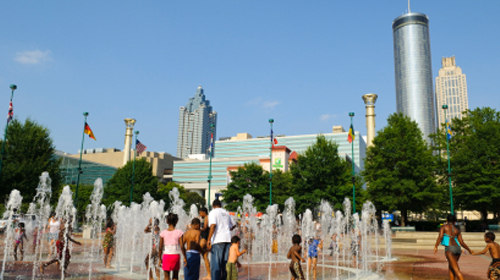 The city of Atlanta offers outdoor activities such as walking through Centennial Olympic Park in the summer, ice skating in the park in the winter, jogging through the 189-acres of Piedmont Park, and golfing at one of the many courses. The vast array of options for dining in Atlanta allow for palates of every kind to be satisfied. There are thousands of restaurants in the metro Atlanta area that range from simple and affordable to gourmet and classy. Atlanta not only offers cuisine from every major U.S. region, but also from regions in every continent. Atlanta residents have options ranging from colorful Moroccan cuisine to flavorful Cuban cuisine to good home Southern cooking. The nightlife in Atlanta is continually flourishing with activity. There are many lively bars including the Buckhead Saloon, the Peachtree Tavern, and Flip Flops. Atlanta has many night clubs including Opera, Club Europe, and the Masquerade. These bars and clubs often provide live music or a mixture of contemporary and classic popular music. Professional sports events are played year-round. Atlanta is home to football’s Atlanta Falcons, baseball’s Atlanta Braves, hockey’s Atlanta Thrashers, and basketball’s Atlanta Hawks. The cutting-edge facilities that host these events are the Philips Arena, the Georgia Dome, and Turner Field. These facilities have also hosted the World Series, Super Bowls, NCAA Regional and Final Four basketball tournaments, the Peach Bowl, Major League Baseball’s All Star Game, and the SEC Championship Game. Overall, Atlanta offers a quality of life that is competitive, if not superior, to many cities in the U.S. There are many attractions and activities for people of all ages and varying interests. Atlanta has a solid foundation and the people of Atlanta continually strive to make it an even better place to live.